From Santa Fe Magazine, 1922. Located in the best residential section of Uptown Chicago, this carefully operated hotel of medium size provides every feature of comfort, convenience and service. Wilson Avenue Elevated, Broadway Surface Cars, Motor Busses. Good garage accommodations. 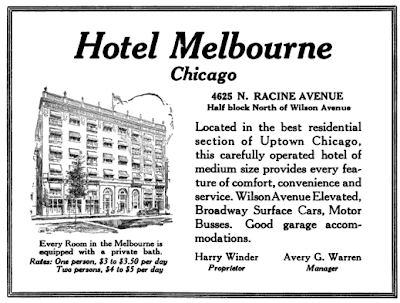 Every room in the Melbourne is equipped with a private bath. Rates: One person, $3 to $3.50 per day. Two persons, $4 to $5 per day. Harry Winder, Proprieter; Avery G. Warren, Manager.